“Tomorrow we’re going to Shangri-La,” our host announces as we approach Hangzhou (a provincial city located in the Yangtze River Delta in China and the capital of Zhejiang province). I know he's not referring to the Shangri-La Hotel because it's not on our itinerary of places to stay. Neither the place of utopia, I read in James Hilton’s book, “Lost Horizon”. Our host has a different spin on the story. He tells us how an American soldier flying over Hangzhou thought he found Shangri-La. 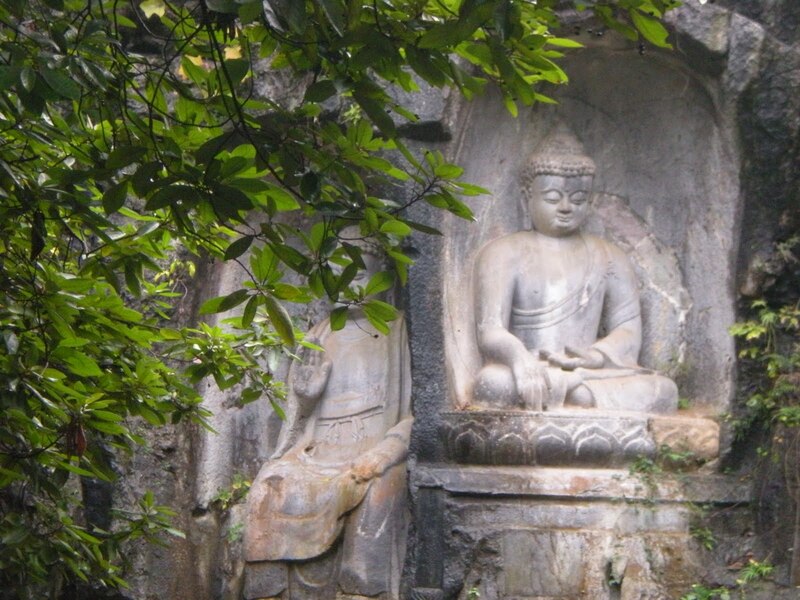 Figuratively speaking, Hangzhou is a world apart from Shanghai and Beijing. I'm able to see the blue sky amid the rain in Hangzhou. Steeped in temples, tea plantations and verdant natural beauty, Hangzhou brings to life the landscape printed on the calendar my mother brought from San Francisco Chinatown. We stroll down the pagoda-dotted path, lined by weeping willow trees from the Shang-ri La Hotel. A special wooden-boat is waiting to take us around the lake. The water lilies and lotuses provide mystical background to the humpback bridge in-front of us. Surrounded by misty peaks and pagodas, the lake conjures images of romance and mysticism. I also have the impression that the boats are geared for tourists like the wooden boat being poled by women in traditional Chinese jackets, the dragon boats, and well-decorated houseboats. I find out later that the well-decorated houseboat is used for the evening sound-and-light show, “Impression of the West Lake” – a spectacular show where more than 200 performers seem to walk on water by a platform beneath the water surface. Dragon Well (Longjing) green tea, one of the most prized green teas in the world is cultivated in the jagged hills of Hangzhou. We go up close to the tea plantation to smell the tea plants and flowers. We then go to the processing area where freshly plucked leaves are dried in huge wok-like pans. Dr. Tea awaits us at the China Museum of Tea to offer an overview of China's national drink - from history to production to preparation. We gather around a conference table while Dr. Tea's assistants demonstrate how to brew tea properly. 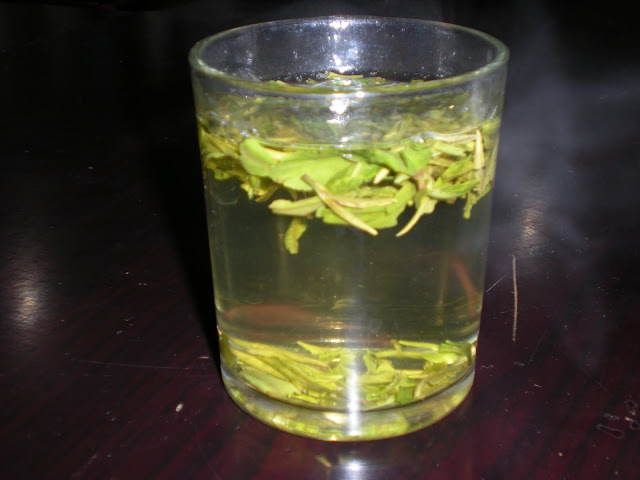 "The green color is maintained by letting the boiling water cook to the correct brewing temperature (around 75 degrees Celsius) so as not to destroy the natural chlorophyll in the tea," explains Dr. Tea. A cupful tasting later, I noticed almost everyone in the group exchanging credit cards with Dr. Tea’s assistants for $185.00 worth of four boxes of grade A green tea. We walk among thousands of visitors, worshipers and local tourists toward the temple's main gate. The hike from the ticket entrance to the temple is long, about 3/4 of a mile. We walk a mountain path lined with Buddha carvings. The mountain path narrows to a tiny maze of streets lined by vendors offering religious relics, souvenirs, and food. The crowd dissipates when we reach the gate to the temples. It seems that we are the only Westerners among the crowd. Suddenly the landscape feels so secluded and quiet. Ling Yin Temple meanders up the side of Ling Yin Hill in a succession of stairways, buildings, and courtyards while the foggy mountains provide a backdrop of peaceful seclusion. I'm in awe that such a place exists. Ling Yin temple is the largest religious facility I have ever seen. Both Dr. Tea and our tour-guide have so many legends to tell with added sale’s pitch that would make a traveler a skeptic. But just being here and feeling the landscape that’s so sublime renders me speechless. 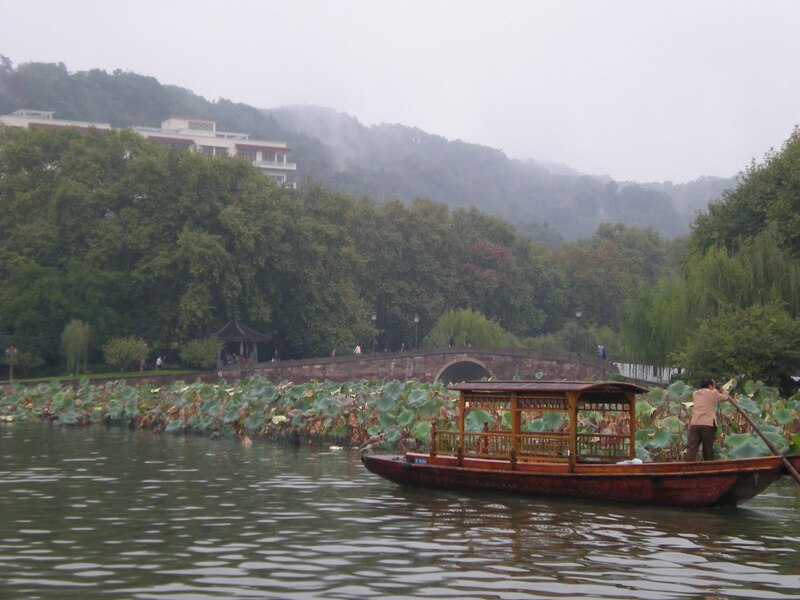 To steal a line from the song ‘Impression of the West Lake,' Hangzhou is a story about landscape. Our trip is co-sponsored by our local chamber of commerce. Our itinerary includes visits to the shopping venues and silk, jade and pearl factories. Some of the benefits of such a trip are a knowledgeable and English-speaking host and tour guides, 4-5 star hotels and decent subsidized meals. Keep your wallet and credit card in check though. Although China’s tourism main target market is the local Chinese, they’re inching toward the foreign market as evidenced by sponsoring our trip. The hotel that we are staying in is not entirely finished, a sign that the city is in the midst of spiffing-up its tourism by encouraging high-end hotels and resorts.